After two years at the helm of Avaya’s social media strategy which produced a very strong ROI in the Social Customer Support area, I am happy to say we finally got that strategy institutionalized within the Support organization so I found myself with a rare opportunity to evolve our strategy from brand monitoring and reputation management to something higher order like Social Insights. So I spent the better part of January looking at every social media listening, monitoring, analytics, intelligence and insights firm I could get my hands on. I looked at dozens of dashboards, and reams of reports. In reality there must be hundreds of firms out there doing social media analysis in some form or another but I tried to hit the most popular ones with the single-minded goal of finding a firm that could deliver the most strategic value from the 2+ years of social media data that’s out there. What follows is an in depth look at what I heard from them so you can make your OWN decision on this space. I tried to go a layer or two deeper than some of the major analyst firms as well so you get a broader spectrum companies that would include some of the smaller firms that normally don’t get mentioned. Having been in professional services marketing long enough I thought I would use the classic 2×2 graphic to explain the findings visually. I found a graphic created by Zach Hofer-Shall from Forrester that was similar in concept so I adapted it for this report. The graphic on the bottom axis assesses the output of these firms from reactive to proactive and the top axis assesses the output from tactical to strategic. (Disclaimer – these are my opinions formed by my conversations with these firms). So lets dig in! I am going to give you a short synopsis of each firm taken directly from the notes I took during my conversations with them and I broke them up into 5 categories: Free monitoring services, Paid monitoring services, Sentiment based analytics, Aggregators of aggregators, and Beyond sentiment analytics firms. Samepoint – This is a small firm based in NYC that provides a free service for monitoring and listening. They are clearly attempting to commoditize the monitoring space with their service and they have a very large dataset that they pull from. A good DIY choice for small brands looking for a no cost option. Socialmention – another free service for monitoring brands with a nice user experience (including some nice graphs and metrics) and the ability to do date range targeting. You can also download the data and operate on it as well in CSV format files. Great for small brands and the do it yourselfer social strategists. Clearly the costs of the monitoring space are going to go to zero, it’s just a matter of when. Radian6 – I originally started with a firm that I own here at Avaya. They are squarely in the listening and monitoring space with a new overlay (this year) of some professional services to produce reports. They have staff to pull monthly reports and do what they are calling “Insights analytics”. The team is on call to determine “Why the spike in mentions or share of voice” to determine “what’s happening and why should you care”. In my estimation they are providing good-looking reports that look like they come from my dashboard with some human analysis of why something spiked on a given day. Alterian – formerly known as SM2 by Techrigy offers a freeimum service that offers up to 5 search terms to monitor for and up to 1000 results, which could be good enough for some small brand with low volume. But it also offers a paid service that offers unlimited terms to monitor and 10000 + results. Many of my friends in PR firms use this service and I have heard of some bigger firms as well. They offer sentiment analysis, trend comparisons, geographic analysis, theme detection, authority measurement, demographic and, a classification engine similar to Radian6 or Sysomos and the same basic price point of about $500 a month. Sysomos – which is now owned by MarketWire is different than Radian6 or Alterian since it also indexes more traditional news (a nice touch). Also it has one of the nicest interfaces with great looking graphs and wizard like charts. They offer 2 products: Heartbeat and MAP. Heartbeat is the closest to Radian6 and Alterian is that its just the most recent news and social mentions, where as MAP can operate on a much larger sample of historical data on an unlimited basis (at a higher cost than Heartbeat). Collective Intellect – They started out as a “listening engine” but they are now positioning themselves as a “text monitoring and analytics leader”. They are a small shop out of Boulder CO providing some reporting and analytics for clients like General Mills and Paramount Pictures. They also provide a unique service from any of the vendors I spoke to around “text mining into a central database with integration into a CRM system”. Which sounded like Social CRM meets Systems Integration company to me. Converseon – They offer a monitoring tool that filters out content not relevant to you. They don’t take a “credit card approach to monitoring”. They set up custom Boolean searches for each client. Cost is one flat fee for up to 40 seats with support. Their data includes the full twitter fire hose (first provider to get the fire hose). They have a research department that produces reports, which come in various flavors. And they don’t use sentiment analysis they use human analysis to provide “derived sentiment”. Crimson Hexagon – Has one of the nicest dashboards I saw. They sell you the tool and you can create your own reports. The tool organizes mentions based on positive and negative sentiment and then you can find subcategories from there. Can help set up items I am interested in tracking and then I can follow them over time. But it’s not like a “Keyword filtering tool” ex Sysomos. They have 2 pricing models – 1 person access with unlimited use vs 1 topic to track (they call it a “monitor”) with unlimited users. Visible Technologies – Not a “self-service model like Radian6” for enterprise level clients that need more full service and want “actionable decisions based on trends within social data. They are the “Leaders in Social Intelligence” – according to Forrester. They have “automated sentiment” based on relevancy. They work on a subscription model limited to 3 users with unlimited searches they have account managers that help you set up Boolean logic for your dashboard. In addition you can buy monthly reports that add quantitative analysis using their analysts. General Sentiment – the core of their system is “expressed sentiment” which is human assisted sentiment because sentiment is “not perfect”. Dashboard shows volume of mentions and sentiment. Can drill into any sharp drops in sentiment and click through to see actual mentions that caused it. There is no human intervention on the data they can help analyze and annotate the mentions. They gather 40 million sources of data per day – news + social media to help you understand what’s driving your sentiment within social media. They can identify a media value using CPM rates: neutral sentiment gets regular CPM, positive weighted higher and negative weighted lower. Syncapse – They are an “aggregator of aggregators” (they have Sysomos, Radian6, Crimson etc). They have a platform based on 3 elements – Build, Manage, Measure and they add services on top of that to help identify what is driving value for you. They work with firms like RIM to grow their 33 Facebook pages, with built in workflow, scheduling, and in multiple languages. They have 150 people in Toronto, New York, and London and have plans to double that in 2011. ConsumerSphere – Another aggregator of aggregators with Crimson Hexagon, Sysomos, etc has “all those tools“ Retained at General Mills, UAL, J&J on specific engagements. Monitoring mapping and mining – 3 phases methodology they use. They “don’t talk sentiment” they are “applying social strategically to business objectives”. They struck me as a very small but very custom shop. Worked with UAL with the Guitar problem and the merger. Cymfony – Cymfony’s dashboard is called Maestro, which is their platform to visualize the data they collect across traditional media, social media and some other proprietary sources. They built you this dataset and remove the unwanted and irrelevant data so that the core of the data is pure before they use their NLP and some human analysis before displaying it on the dashboard. They also provide professional services to deliver deeper insights through its Market Intelligence Studies to answer specific market research questions. Overtone – Talks about a “SaaS tool combined with Professional Services” approach and they refer to themselves as a “Market Research Data Source”. Their product / dashboard called OpenMic delivers results based on NLP (an “artificial intelligence-based engine”) that uses advanced text analytics read each message about a brand and analyze it in real time. Rather than just producing keyword “hits”, OpenMic generates an accurate view of “what is being said” across any interaction channel. “That turns Social Media into something you can use for Strategic Decision Making”. NMincite – This is the artist formerly known as BuzzMetrics, which is owned by Nielsen who is now in partnership with McKinsey. They have both products like BuzzMetrics and solutions like brand reports, and brand health checks. They approach the reports much like a research firm so it’s very unbiased as well as comprehensive. They can track “buzz” on a quarter of quarter basis and really dig into why it might be changing or evolving. They also have their Blogpulse freeimum service where you can discover trending topics in the social sphere. Networked Insights – they provide a dashboard called SocialSense (on a SaaS and API basis) as well as stand-alone reports based on business issues. They built you a dataset (they call a “audience”) that is made up of only relevant data from which they draw insights from their dashboard or with their expert analysts (which are trained in Cultural Anthropology). They use Hierarchical Topic Discovery, which is more accurate than Sentiment or NLP because it clusters conversations based on natural language rather than sentiment. They also provide SocialSense Categories which are “cores” based on popular segments like Moms, Autos, Consumer Electronics, Sports, Politics which are like Google Trends but only on these topics. They have a number of clients using their Insights to make “proactive business decisions” like creating new products in adjacent markets or planning paid media based on the insights they are getting from them. Hopefully you found this information useful – I really think this area of the market will be strong for the next few years. Feel free to let me know how you are using some of these tools to help your company make better business decisions! Thank you for your thoughtful analysis of our industry, particularly concerning the value of “social insights” vs strictly monitoring. In fact, the basis of the ConsumerSphere business model: “strategic social solutions” reflects our complete agreement with your assessment. @Anol – good catch thank for the comment! One more to consider is my company Conversition Strategies which has a business offering called EvoListen. This is a market research product that applies scientific marketing research principles to the analysis of social media data. It was build by researchers so it includes thousands of variables relevant to market researchers. Great article Paul, thanks. It truly is a growing and confusing space. I thought you might also enjoy an article our CMO wrote on this topic Brand Monitoring is not research http://humanvoice.wordpress.com/2010/03/03/brand-monitoring-is-not-research/. Having worked with some of this platforms, I’ve appreciated your even-handed post. I’d add that some of them are someway lacking the ability to analyze not English conversations, though I understand this is a major issue especially for non-US firms. Thanks Patrick – what languages are you able to do? Thanks Paul. I am curious how you see social media analytics/listening/monitoring in the context of the larger “customer experience management/analytics” space? The structured and mostly unstructured data that comes from the social networks is but one of many data points involving “the customer”. The holy grail seems to be making the unstructured data coming from social networks, IVR, etc actionable at a dashboard level. Curious how you are looking at this issue at your company. 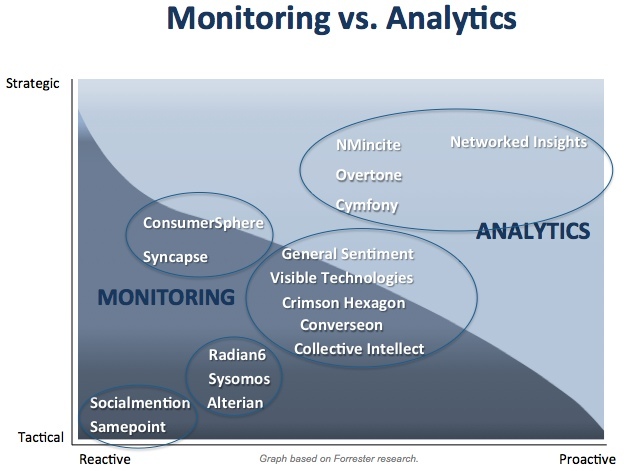 The landscape for social media monitoring and analytics is changing before our eyes and has been a challenge to grasp. You have done an outstanding job pulling together a large amount of information and adding your expertise. A truly awesome effort. Thank you! @Cheryl – thank you so much – its comments like yours that make it all worthwhile! @Kamal – ok I will start thinking about that – I might need to do some research on it! @Henry – well its clear that those two spaces need to come together – no product I tested had this “built in” at least not yet – Radian6 did have some Salesforce integration but thats about it. While at Avaya I helped to develop an integration with Radian6 and the Contact Center. This will become the norm for major brands over the next year or two. I found a site yesteday which appeared a lot such as this, are you positive an individual seriously isn’t replicating this website? if only every synopsis could be as comprehensive, informative and consolidated as this, i would certainly have more hours to read some great fiction!!! Paul – Nice post. I’m curious to see if you looked at Spredfast. We would fall in your “analytic aggregator” category. It would be great to get your take. @Kenneth – YES I did look at Spredfast and in fact I LOVED it – but you guys do so much more than the “aggregators” that I profiled – they are mostly dashboards of social data and reporting where as you guys aggregate the Twitter, Facebook comments of the people within the company – all around the Boolean search(s) that you are running on your system. Much more functionality than anyone that I profiled – but I guess that’s a good thing! Paul: Thanks for the helpful analysis. Paul – Awesome piece of work. Thank you for taking the time and effort to present this overview. We are working on the SMB Avaya social campaign and your work in the space has been an inspiration. The only drawback I see is that you have opened up a big can of worms. Every vendor on the planet is now going to drop you a line and say “what about me.” 🙂 Just ask @jowyang about his list of social strategists! I hope the pain is well worth the effort. Congrats and looking forward to your continued work. Thanks Richard – totally agree there are so many vendors out there I could make this blog post a full time just just tracking all of them!